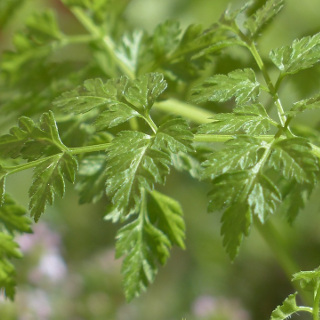 Chervil has a delicate flavour similar to parsley but milder with a slight aniseed taste. Used in soup, sauces or as a seasoning for seafood or vegetables. Hardy annual that will sometime survive for two years. 6-8 weeks to harvest. Approximately 400 seeds per packet. Chervil is native to the Caucasus region between Europe and Asia. Chervil was used by the Romans and they spread it across most of Europe, because of this it can now be found growing wild in many areas throughout Europe. The flavour of Chervil is similar to parsley but much more milder and delicate with an additional hint of anise. Chervil is a versatile herb used regularly in French cooking. Chopped Chervil can be used as a primary flavouring for soups and sauces, or be used in combination with other herbs and spices as a seasoning for seafood, salads, omelettes, poultry and vegetables. Chervil should only be added at the last minute of cooking as the flavour is delicate and can be destroyed by prolonged heating. Chervil is best used fresh as it'll lose it's flavour in about a week once picked and dried Chervil will also lose its flavour rapidly. Freezing Chervil for longer term storage is best, you can do this by chopping it up finely, adding a little water and freezing it in small, ready to use blocks in an ice cube tray. The scent of Chervil attracts slugs, you can take advantage of this by planting Chervil as a sacrificial plant next to other susceptible vegetables. Alternatively you can use chopped Chervil leaves as a bait in home-made slug traps. Chervil plants produce large clusters of small white flowers that are a nectar source for and help to attract beneficial insects to your garden. Chervil grows best in a lightly shaded location, too much heat can cause Chervil plants to bolt to seed and become bitter so don't plant them in full sun if you live in warmer areas. Ensure soil is free draining before sowing, dig through lots of organic matter such as well-rotted manures, compost or worm castings a few weeks prior to sowing to improve your soil. Grow Chervil in raised beds if your soil is too compacted or heavy with clay. For best growth fertilise Chervil plants every couple of weeks with an organic liquid fertiliser, worm juice or a small amount of a pelleted organic fertiliser. Keep well watered, Chervil plants like damp but not waterlogged soil conditions and will also bolt to seed if their roots become too dry. Avoid getting too much water on the leaves to prevent fungal diseases. Mulch around your Chervil plants well to help retain moisture, keep their root system cool and suppress weeds. Picking Chervil leaves regularly can help to reduce the chance of bolting and prolong the life of your plants. Cutting of the flowering heads as they form can also help to prolong the life of your herbs. Chervil is tolerant of light frosts but will die back if the weather gets too cold. Chervil is a biennial but you'll often only get a season worth of growth before it bolts to seed and dies. Chervil isn't suitable for growing in pots as it has a long taproot that needs room to grow downwards. In cooler regions of Australia sow Chervil from October to January, In temperate regions of Australia sow Chervil from September to December. In subtropical regions of Australia sow Chervil seeds from April to June or during September. Chervil is unlikely to grow well in the tropics. Sow Chervil seeds 5mm deep directly where they are to grow as they have a long taproot and don't like to be transplanted or disturbed or else they bolt to seed. Space or thin seedlings to about 20cm apart to give your Chervil plants plenty of room to grow to full size. Sow a few Chervil seeds every week to ensure you have a continuous supply of Chervil to harvest. Chervil seedlings take between 10 and 14 days to emerge after sowing. Soaking Chervil seeds overnight prior to sowing can help them to take up water and speed up their germination. Chervil herbs take between 6 and 8 weeks to start producing enough leaves to harvest. You can pick the whole plant at once or just harvest a few leaves here and there as needed.